Living in Italy isn’t always easy. There’s a whole bunch of unwritten rules and conventions that can be simply impossible to grasp as a foreigner. I am not even a real stranger to this country (In fact, I’m 50% Italian which is practically unnoticeable except for when I’m gesturing wildly, which tends to happen) and I still make an arse of myself ALL OF THE TIME. Many of these particular incidents are downright embarrassing, some just leave you hungry or confused or both. Here’s four of the numerous times I messed up while living here – and my very personal approach to damage limitation. Italians really have a thing for very specific meal times. Lunch starts from about 12.30 and can be eaten up until 2 pm and that’s it. Seriously, this is a non-debatable norm in Italy. I did a grammar exercise with some kids at the high school where I “assist” the teacher (or do the lesson while she checks her emails because I’m so very qualified for that – topic, topic, what was my topic?!). During the exercise the kids were supposed to explain what they did the day before at certain hours. One of the guys got the hour wrong and answered that at 4 in the afternoon, he had been eating pasta. The other kids in the class just lost it, they laughed their faces off as if he had just revealed that he was busy cuddling his favourite teddy bear at that time. What I’m saying is: If you missed lunch hour, don’t even try to find a cooked meal to be served to you. Not gonna happen. Avoid a desperate, useless and for Italian minds absolutely incomprehensible search for food at let’s say 3 pm, just grab some pizza al taglio or a panino and wait until cooked food is socially acceptable again. They’re not kidding about this. Sometimes you do everything right, your breakfast was tiny enough to have you hungry by 12.30 pm and you start to look out for a nice place to have pranzo. The problem is: So does everyone else. The city you’re in seems to be ridiculously busy and all of the cute places you come across you can’t quite seem to squeeze yourself into – leave alone find a table to actually eat at. This happened to me the other day when I was visiting Arezzo (and apparently, so was the rest of the nation, because it was a public holiday). I will be honest here: A no food when hungry situation is a serious bummer for me. And frankly, for everyone unfortunate enough to be around me. How do you fix this mess and save your day from being ruined by a major case of aggresive hunger syndrome (or should that be hungry agression)? That’s right, you go back to Solution No 1 and stuff your face with pizza al taglio again. I know it’s not equally satisfying as the nice lunch you probably had in mind, but it is cheap and usually good if you like pizza (who the hell doesn’t?). Most of all – it is easily accessible and fast, which at this point, if you are anything like me, are the main arguments here. To make up for the lack of an actual cooked lunch meal, I can only recommend having an overpriced coffee* at the main piazza, then refusing to move from your sunny lookout for about two hours and just letting the crowds swarming calm you down. 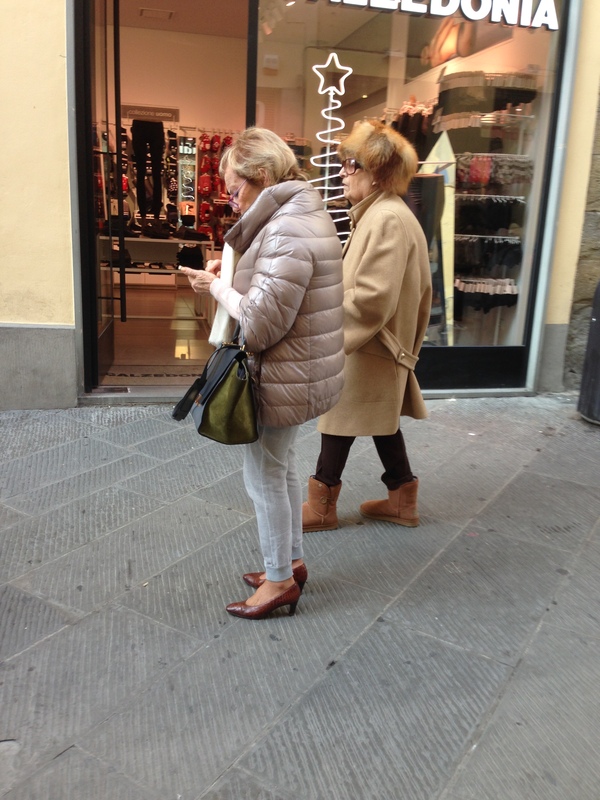 Pay special attention to the Italian street style here, which surely isn’t for everyone. In Italy, there is no such thing as being overdressed, ever. Every stroll is a catwalk. This doesn’t stop at 89 years old when you can hardly walk and it doesn’t exclude fancy three year olds either. Many of the kids are dressed so delicately (and probably more pricey than yourself) that it is clear they are their moms’ brightest accessories – which obviously is to say a lot, because the moms are strutting by in knee-length high-heel boots, fur jackets, super expensive handbags and optional other shiny stuff. How could you stay mad at whatever genius pasta you missed out on when marvelling at the beautiful people of Italy showing off their natural grasp of style? It’s simple, you can’t. Day saved. *As you have already messed with Italian culture, you might as well make that a cappuccino, which is strongly frowned upon by most Italians, because cappuccino contains milk, which makes it a breakfast thing. 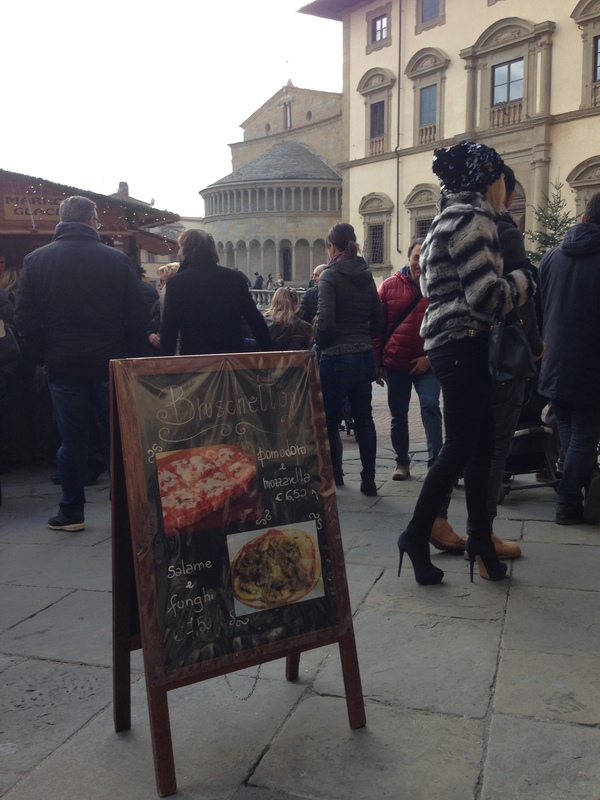 So, if you want to blend in with the Italians, better not order one after 11 am. In this case, I shall say, I tend to accept the judgmental glares cause, you know – I like milk in my coffee. …I hope these ladies’ stylishness will soothe you. Along with the great sense for style and fashion that many Italians seem to own as a birthright comes another high risk for every non-Italian to just do everything wrong when it comes to dressing. As we all probably won’t be able to do justice to the Italian street style (for above mentioned genetical reasons), we might as well stick to the basic stuff and just try to at least dress appropriately for the weather while in Italy. Think you can do that? Yeah, I thought so, too. Many Italians I know are insanely cautious about catching a cold or whatever other horrifying disease might infest their system by not wearing a jacket and scarf in every month that isn’t June, July or August. One still pretty hot day in October, I was brave enough to take off my sweater because I was practically melting in my sunny spot of the universe. I then took a quick trip to the nearby supermarket to grab a bottle of water and had to seriously consider the possibility of having turned into a true-to-life unicorn on my way – at least that would have explained the looks I got! More accurately, this should be: telling someone you’re German. This is not a mistake from the beginning, but after having spent some time especially in Northern Italy, it sure will feel like one. Because once you mention you’re German, everyone will have a story to tell you. Everyone, I swear, everyone has either been to Germany or so has their sister, uncle, cousin, grandfather or dentist. As the two countries aren’t that far away from each other, this is not a huge surprise. Everyone I know in Germany probably knows someone who has been to Italy (me obviously? Very weird logic here). The really astonishing thing is: they will tell you about it every time – if they know any details about this particular visit or not. For example, kids at school will say things like “my cousin has been to Germany” and you will say “cool, where did she stay?” and the answer will most often be “I don’t know” or “Swiss”. But hey, that’s kids and it’s mostly very cute. I will be honest though – after the hundredth story about that one person that went to la Germania once, you will feel quite fed up while smilingly replying bello, bello. Oh and how are you going to fix this? You’re not. You’re going to hear out all the tales of when someone went to Berlino, Monaco or Francoforte. And after the initial phase of heartwarming “aww” and the very quickly following “I don’t even care where your zia has been”-stage, you will find yourself in a very comfortable place somewhere in between these two extremes. And you will only very rarely want to punch yourself in the face for saying where you’re from. Sidenote on that: One day after publishing this blog article, my “Being German” impression was kind of put into perspective so I thought I should share the experience here. I was at a bar with my friend, when an Italian gentleman overheard as speaking in German, what he took as an occasion to come up to our table and perform a hitler salute, while repeating “deutsch, deutsch, deutsch”. Mildly irritated, I asked him why he did that, whereupon he answered that he was Hitler’s grandson. I then decided to ignore him (which obviously, I should have done in the first place) and he decided to stay right beside us with his right arm in the air while calmly eating his kebab (I’m not even kidding). Some other people who knew the guy approached us and told us that “it doesn’t matter” because he’s not right in the head. I felt like starting a discussion about whether or not it mattered that someone does that into somebody elses face, but was put off by the constantly repeated “doesn’t matter” thing. After another minute or so, the guy finally left our table and we went inside to pay our bill. When we left the bar, he was already standing by the door waiting to “salute” us again, while everyone else was watching and minding their own business. This has never happened to me before, neither in Italy nor elsewhere, and it sure wasn’t pleasurable but what I ment to say was just this: I’ll gladly take the stories of ALL your family members’ and friends’ visit to Germany over that anytime. Your love for my country will from now on be appreciated, folks! Hi Aneta, sorry I’m a bit late on replying, but thanks very much for your comment. Glad that my post has succeeded to amuse you 🙂 Happy 2016! Haha, this cracked me up. As a Canadian living in Italy, I totally get what you’re saying – I know those “oh, my uncle once travelled to Canada” conversations all too well, and by now I’ve probably put at least a hundred little old ladies into a state of shock when I go running in shorts and a tank top on a chilly October morning (or maybe it’s less the attire and more the fact that I’m running?). Oh yes, I can attest that as a Canadian in Germany (or anywhere, this happened in the UK as well), we get the ‘My second cousin went to Canada once.’ Also the: ‘Do you know Peter, he lived in Canada?’ But I totally ruined this by actually knowing the person in question, more than once. So that’s that myth proved then, isn’t it? !